John Adams, Jr. was born in the Massachusetts Bay Colony in 1735 in the town of Braintree (today known as Quincy). His parents were John Adams, Sr. and Susan Boylston Adams. At the age of 15, Adams went to Harvard College, where his father expected him to become a minister. After graduation in 1755, he taught school in Worcester, Masachusetts. It was during this time that he decided to become a lawyer and he studied in the law office of James Putnam. Adams was admitted to the bar in 1758. John was not the only Founding Father from the Adams family line, nor was he the only President. His second cousin, Samuel Adams, emerged as the popular leader of the Sons of Liberty and his son, John Quincy, was elected the sixth President in 1825. Facts are stubborn things and whatever may be our wishes, our inclinations, or the dictums of our passions, they cannot alter the state of facts and evidence. Adams represented Massachusetts in the both the First Continental Congress (1774) and the Second Continental Congress (1775). In 1775, Adams nominated George Washington of Virginia as the commander-in-chief of the fledgling American army. On June 7, 1776, Richard Henry Lee put forth a resolution of independence, saying “these colonies are, and of a right ought to be, free and independent states.” Adams seconded the resolution, which was adopted by Congress on July 2, 1776. Adams was appointed to the Committee of Five, along with Benjamin Franklin, Thomas Jefferson, Robert Livingston and Roger Sherman to draft a document that would announce the reasons for the American colonies to become independent from the British Empire. In September of 1776, Adams was part of a delegation that met with General William Howe, after the defeat of the Continental Army at the Battle of Long Island the preceding month. The meeting was held on Staten Island in New York Harbor. Howe demanded that the delegation rescind the Declaration of Independence, which they refused to do. 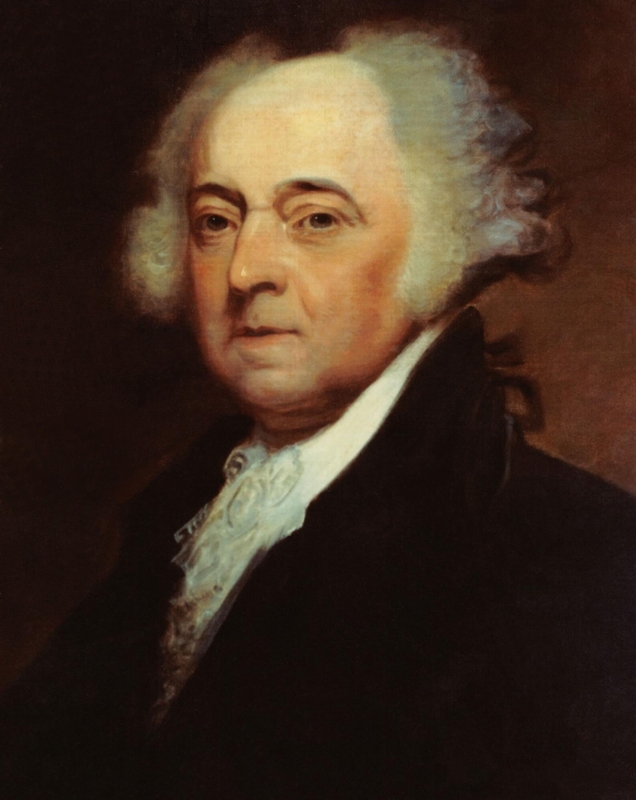 In 1777, Adams was asked to go to Europe to represent American interests. 10-year-old John Quincy accompanied him on the journey. They sailed on the frigate Boston on February 15, 1778. During the journey, the Boston was chased by British warships, but they were able to cross the Atlantic safely. The stay in Europe was brief, and they returned to Braintree in August of 1779. Shortly after his return from Europe, in September and October of 1779, Adams was selected by the people of Braintree to represent them as delegate to the state constitutional convention. 312 delegates convened on September 1, and soon thereafter they chose Adams, his cousin Samuel Adams and James Bowdoin as the committee responsible for drafting the constitution. The other two chose Adams to draw up the document, and he completed his draft on October 30, 1779. The Constitution of the Commonwealth of Massachusetts, ratified in June 15, 1780, is the world’s oldest functioning written constitution. It served as the model for the U.S. Constitution. At the conclusion of the Massachusetts Constitutional Convention, he departed on a return to France on November 15 aboard the frigate Sensible. During this second stay in Europe, Adams was involved in negotiation a treaty with Britain that gave American ownership of all lands east of the Mississippi, secured the Dutch recognition of the United States as an independent government and the first commerce treaty between America and a foreign nation other than France. During his stay in Amsterdam, he purchased a home which was the first American-owned embassy on foreign soil. In 1784 and 1785, he worked with Thomas Jefferson and Benjamin Franklin to develop trade relations with Prussia. In 1785, Adams was appointed the first Ambassador to Great Britain (Minister to the Court of St. James). Finally 1n 1788, Adams returned home. In an effort to maintain consistency between the Washington cabinet and his own, and to maintain peace, to some extent, within the Federalist Party, Adams asked the four department heads to join him: Secretary of State Timothy Pickering, Secretary of the Treasury Oliver Wolcott, Jr, Secretary of War James McHenry and Attorney General Charles Lee. Pickering, Wolcott and McHenry were High Federalists, who followed the lead of Alexander Hamilton. They were also staunchly anti-French and pro-British. This made Vice President Jefferson’s affinity for France a problem moving forward for President Adams. On the eve of the inauguration, Adams and Jefferson met. Adams presented a plan to send Jefferson, James Madison and Elbridge Gerry to Paris to negotiate with the French. However, the day after the inauguration the High Federalists in his cabinet objected staunchly to the inclusion of Madison in the group. When Wolcott threatened to resign, Adams gave in. To Jefferson, this signaled that his old friend could not rise above the politics and work across party lines. Adams and Jefferson, close friends since they met at the First Continental Congress in 1775, now parted ways, separated by the politics of their parties. Jefferson would lament later that from that point on, Adams would no longer seek his advice on how to deal with France. Adams, on the other hand, could no longer depend on his Vice President’s loyalty. The French did not take kindly to the Jay Treaty, and saw it as an alliance between the United States and England that was unfair to French trade. France began to seize American ships and refused to receive minister Charles C. Pinckney. Pinckney was threatened with prison and fled to safety in the Netherlands. Eventually, Pinckney returned to France with John Marshall and Elbridge Gerry, where they were met with three French agents that demanded concessions from the United States in return for continuing the peace negotiations. Adams dubbed these agents X, Y and Z to the press. The American emissaries refused, and Marshall and Pinckney were deported. Gerry stayed behind in France, but was not able to make any headway towards peace, and the French continued to raid American ships. In 1798, the Quasi-War, an undeclared naval war, broke out between the United States and France. The administration was embarrassed by the XYZ affair, in which three French agents demanded concessions, including bribes, from the United States in return for continuing negotiations. This led to an increase in public sentiment against France, and embarrassed Jefferson and the Democratic-Republicans. In the middle of 1798, the Quasi-War between the United States and France broke out. The Quasi-War was an undeclared naval war, which ended in 1800 with the Treaty of Mortefontaine. During these negotiations, the United States began to build up its navy, and the threat of war led Adams to support the idea of the formulation of an army as well. These Acts were highly controversial and stirred up opposition from Jefferson and the Democratic-Republicans. In 1798 and 1799, the Virginia and Kentucky Resolves were passed by the respective state legislatures in protest of the Alien and Sedition Acts. These documents were written secretly by Thomas Jefferson and James Madison. Although Jefferson was Vice President, the Kentucky Resolves essentially under-minded the authority of the Federal government. Within his own party, the Federalists, Adams found himself at odds with the High Federalists over the new army. When Washington was named commander, he insisted that Alexander Hamilton be named his second in command, to which Adams reluctantly agreed. On November 1, 1800 Adams became the first President to take residence in the President’s Mansion, which we know now as the White House. However, the stay was short, as he lost the election of 1800 to Thomas Jefferson. In the days leading up to the end of his tenure, Adams appointed several judges that would become known as the “Midnight Judges.” Adams retired into private life at his home, Peacefield, near Quincy. The close friendship between Adams and Thomas Jefferson began in 1775 when they met at the First Constitutional Convention. Not only did they work together with Benjamin Franklin to draft the Declaration of Independence, but they served together with Franklin in Europe after the Revolution, working to create trade agreements for the new nation. However, the friendship dissolved over party politics. But in 1812, at the behest of Dr. Benjamin Rush, Adams sent a letter to Thomas Jefferson that rekindled their friendship. The result was a series of 148 letters over 14 years between the two Founding Fathers. Adams lived to see his son, John Quincy Adams, become the sixth President of the United States. On July 4, 1826, Adams died at his home in Quincy. It was the 50th anniversary of the signing of the Declaration of Independence. Just before he died, Adams said, “Thomas Jefferson survives.” Adams was unaware that Jefferson himself lay ill and died just hours earlier that same day.